GeoBlock® Porous Pavement | GeoCHEM Inc.
Geoblock® Standard 5150 (GB 5150) and the Geoblock® Porous Pavement Systems are a series of interlocking, polyethylene paving units designed to provide superior load support and turf protection for emergency and utility access lanes, auxiliary parking, golf cart pathways, trails, and other high-use application areas. The Geoblock® system provides vehicular and pedestrian load support while protecting the grass from the harmful effects of traffic. The Geoblock system covers a larger surface area per unit .5m x 1.0m x 50mm (20" x 40" x 2 inch Nominal), reducing costs and increasing ease of installation. The system's four-sided tabular, interlocking joint design aids in pattern layout and transfers shear loads from block to block. While some talk about strength per square foot, the structural integrity of the Geoblock® system is built in. The system features a four-sided tabular, interlocking block design that provides superior load-bearing performance and performance and layout design and construction flexibility. The recommended staggered placement (bricklayer’s pattern) of the individual Geoblock units further increases the system’s load distribution capabilities and maximizes the number of adjacent units used to effectively spread concentrated wheel loads over the largest possible area. From fire access lanes to hiking trails to ATV trails, parking areas, to golf cart paths, the Geoblock® system improves both the usefulness and aesthetics of an outdoor environment. Emergency and utility access lanes, Auxiliary parking areas, Pedestrian walkways, ATV trails and wheelchair access ways, Approaches to monuments, statues and fountains Golf cart path shoulders and aprons, Driveways, driveway shoulders and medians. Click to See Fire Access Lane Case Studies The City of Kentwood, Michigan and AT&T Corporate Center, Basking Ridge, New Jersey. Click here for Step-by-Step Installation Demonstration Video. Click here for GeoBlock component specifications and configuration examples. CLICK HERE FOR MANY MORE CASE STUDIES, ARTICLES, INSTALLATION PHOTOS AND VIDEOS! 1) The Geoblock® unit, 2) the engineered base for support, 3) the selected topsoil infill, and 4) the selected vegetation. Both the Geoblock® unit and the base support soil work together to support the imposed loading, while the Geoblock® unit and the topsoil contribute to the vegetative support. 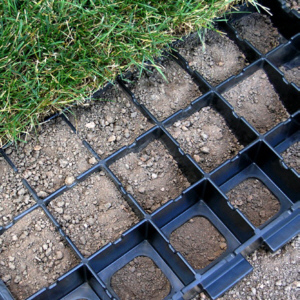 Other components may include a geosynthetic separation / reinforcement layer, sub-drain components, and topsoil additives, which enhance vegetative growth. Suitable topsoil should be pulverized prior to filling the Geoblock® cells and contain sufficient organic content to support vegetative growth. Topsoil such as sandy loam is recommended. Clay and clay loam materials are considered unacceptable. 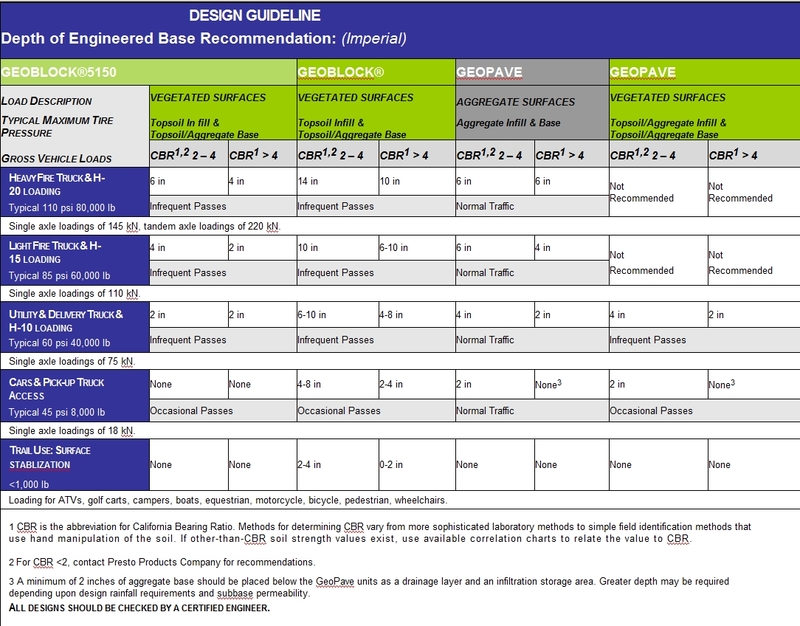 A recommended ‘engineered base’ consisting of clear-stone / crushed rock having an AASHTO #5 designation blended with topsoil will promote vegetative growth and provide required structural support. The aggregate portion shall have particles ranging in size from 9.5 to 25 mm (0.375 to 1.0 in) with a D50 of 13 mm (0.5 in). The percentage void-space when compacted shall be at least 30%. Topsoil, equal to but not greater than the aggregate void percentage, shall be added and blended prior to placement. The mixture shall be compacted to a density that will provide a minimum California Bearing Ratio of 7%. Under some conditions, a geotextile separation layer may be required between the natural ground and the ‘engineered base’. A recommended ‘engineered base’ for non-vegetated porous pavement systems shall be a well-graded aggregate with a fines content less than 10%. The aggregate shall be compacted to a density that will produce a California Bearing Ratio (CBR) of 7% minimum. After compaction, the surface shall be uniform with no protrusions from larger aggregate particles. Contact Us for design assistance, specifications and/or technical field support and representation. GeoCHEM offers assistance to anyone interested in evaluating, designing, building or purchasing a Geoblock® porous pavement system. You may access these services by Contacting Us. GeoCHEM reserves the right to withhold any information from any individual or company. In many cities, current storm water management systems are pushed beyond their capacities by run-off from traditional hard surfaces. With over 87% open area at the surface, the Geoblock® system offers a permeable solution. The Geoblock® design allows water to percolate into the ground through drain holes in the bottom of the units, decreasing storm water run-off and allowing natural groundwater replenishment. Under rainfall simulation of 64 mm/hour (2.5 inches), the run-off coefficient for the Geoblock® system is 1.5%. The Geoblock® units are manufactured from up to 100% recycled polyethylene and are inert to common chemicals, will not absorb moisture and are unaffected by freeze-thaw cycles.